State and Federal laws require employers to provide a safe, harassment free work environment. Failing to provide such an environment places employers at risk of being in violation of the law and costs money in terms of low employee morale, low productivity, high employee turnover and risk of civil litigation. Ensuring a harassment free workplace requires active participation by management and staff at all levels of the organization. 1. Establish the culture at the top. Organizational culture starts at the top and it is imperative that leaders create an open, supportive, harassment-free work environment. Leaders must be hands-on to ensure zero tolerance of harassment. Once the culture is established, training and awareness programs can be effective in a supportive environment. 2. Closely monitor rumors and complaints. Take all complaints seriously and investigate thoroughly. Most harassment takes place at the lowest levels in an organization and can be easily dismissed. We call it the “That’s just Mike syndrome”. People can become conditioned to accept the unacceptable by dismissing repetitive inappropriate behavior as “ok” because “that’s just the way Mike is.” Sexual harassment can occur anywhere in an organization, but statistically, the organization is biggest at the bottom where the greatest opportunity for behavior that deviates from acceptable standards exists. 3. When complaints arise, evaluate the culture. 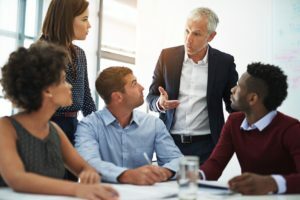 If harassment complaints appear higher in one area or division than another, look at management and ask the question, “Is the culture reaching all levels in the organization?” and if not “why”? Be watchful for management incompetence, resistance, lack of buy-in and ambivalence. Unsupportive managers can destroy your harassment-free culture for employees below them in the organization. 4. Everyone owns the issue. You don’t have to be a victim of sexual harassment to report it. It is critically important that everyone owns the issue. Reinforce all employee’s understanding of the responsibility to report through training. Different companies may find effective solutions in very different ways based on existing culture, but thinking harassment is simply a supervisory or HR problem is a sure-fire way to miss the mark. Ownership at all levels starts at the top! 5. Benchmark with other best-in-class organizations to examine and adopt effective training and culture-enhancing programs. All organizations have room for improvement! Failing to provide a safe working environment can place employers at legal jeopardy and in direct violation of OSHA and EEOC regulations. By not addressing harassment in the workplace employers can be at risk of fines, penalties, costly litigation, and damage to reputation. Maintaining a harassment-free workplace is not just the law, its good business!